I usually blog about my projects, but today I want to discuss KNOWLEDGE and lack thereof. On three separate occasions this weekend — one in person, two online — I was asked a question for which I did not have an answer. I notice this is happening more and more frequently. I don’t think it’s my swiss-cheese memory coming into play so much as that I’m writing and teaching classes a lot these days, so asking me questions seems natural. I have to be honest here. It’s HARD not knowing an answer to something. I love being a source of information for others, in both my hobby and my career. In fact, I thrive on it. There’s a special thrill in being able to answer a question with confidence and plenty of delicious details. But because I love knowledge so very much, that is precisely why it’s so important to acknowledge when I don’t know the answer to something. Plus, if I made the grave error of just guessing, and my guess were wrong, trust would be an issue. Trust is very important. And as much as I love knowing the answer, I feel horrible about leading anyone astray. Our culture does not reward those who “do not know.” Teachers mark us down. Employers file bad reports. Customers scoff. And in my case, readers stop reading and listeners stop listening. 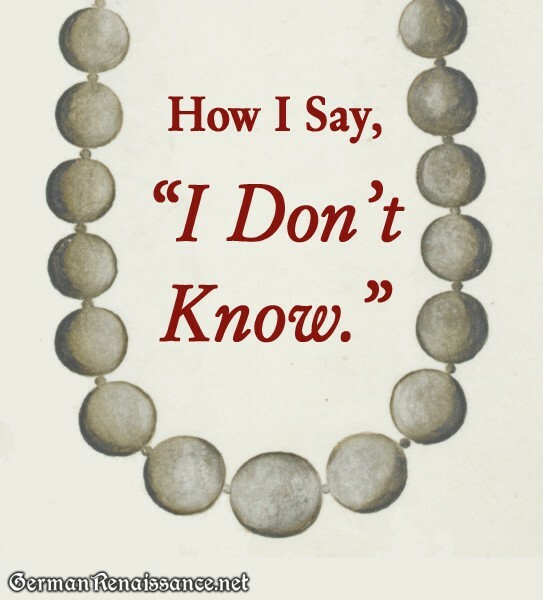 When I remarked once on a podcast that “I don’t know,” I got a flood of e-mail telling me that if I was going to talk about something on the air, I should KNOW. 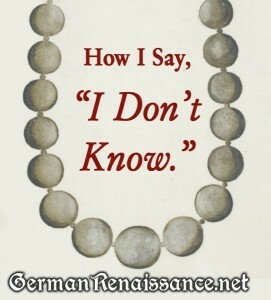 I really think it okay to not know, though. It’s okay to admit it. In fact, it’s not just okay, it’s crucial. But, I must confess. To appease my ego, I will say, “I don’t know, but … I know someone to ask,” or “Wow, that is a great question — now I’m really curious myself.” And off I go to look around, check the museums, and ask other people. That’s right. Questions are my gateway drug. For when I realize there’s a question I don’t have an answer for, but that I know an answer must exist somewhere, I find it rather fun. It’s like a scavenger hunt and I must find the answer! It sure looks to me like those would be string/silk knots between the pearls, don’t you think? It doesn’t look like metal or anything else to me. This image is from an an album of jewellery designs by Arnold Lulls, a Dutch jewelry designer who moved to London (source: Victoria & Albert Museum, D.6:16-1896). In that same album, there’s a simpler string of pearls (no pendant) and it also clearly looks knotted to me. 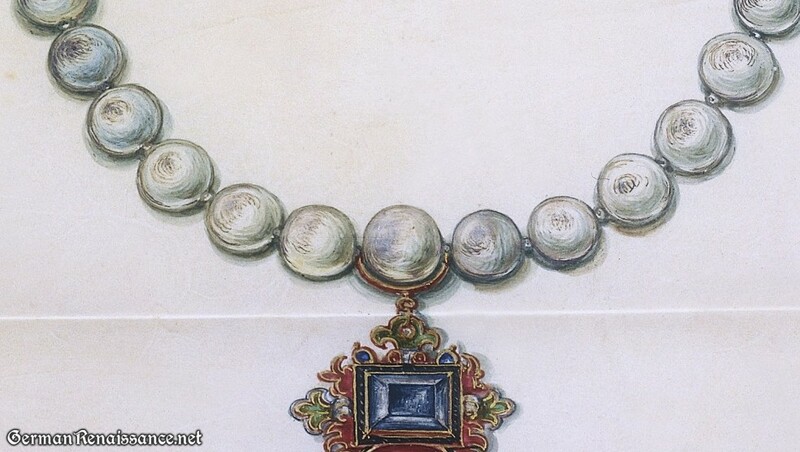 Does anyone reading this know of an extant necklace with knots between the pearls? 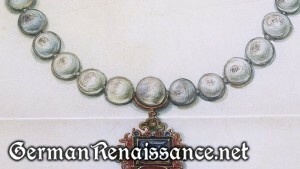 I have Ronald Lightbown’s Medieval Jewelry Book on my hard drive. I will take a look and see if he has anything to say about it. I also hate not knowing the answer to a question, but for a completely different reason. On the knotted pearls question. I have tried to find the answer on this for eons.I have a friend that is a gold smith, & a sister-in-law who is a museum curator. & I asked them both this question, this at least a decade ago. We have all searched for the answer and debated it endlessly.The problem is that a set of pearls, as well as other valuable stones, is that the materials that were, and still are used,will eventually just fall apart. And thus a set will be strung over & over again, then passed down from one person to another.Yes these beads came down to me from so & so, but is that stringing material period. Some will answer that yes we have in such & such museum a period set that were knotted. But were they knotted in period? If you examine a load of period paintings there appears to be beads that are either knotted or have little spacer beads in between. No one as yet to my knowledge has tested what are suspected to be period stringing materials, to really verify this. That’s because the testing such as carbon dating, is insanely expensive, & this just isn’t a burning question among academics. So I would venture to say that yes it was possible done can we prove it probably not. Such is period research! LOL I knot my pearls and beads simply because it is safer. If you have ever had a string of non knotted beads break on you, you will find out very quickly why you want to put a knot between every bead. I had a set of beads break on me at court,years ago, there were beads rolling everywhere, with everyone trying to grab them. Boy what a free-for-all. And I lost several, never to be found yet sorely missed. To knot or not to knot, that is a question! I’m with Lady Cate. Thinking that pearls must have been insanely expensive… Knotting simply makes sense because you don’t want to loose all your pearls/beads when the string breaks, but do I know if this was done? No I don’t. Looking at portraits some look knotted, others don’t. Which brings me to the next question. What was used to string the pearls?